Designed to improve workflow, limit downtime and easily integrate with multi-user fleet environments, the reliable and compact imageRUNNER ADVANCE C355iF all-in-one printer produces high-quality color images while remaining user-friendly. 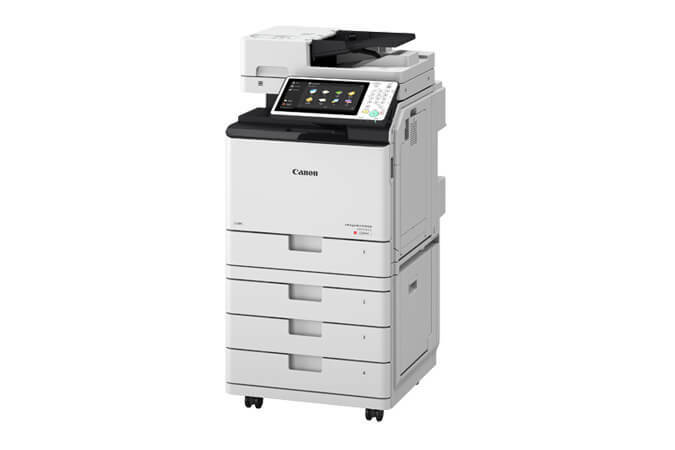 As part of Canon's advanced line of multifunction printers, imageRUNNER ADVANCE C355iF presents an ideal solution for workplace environments that require an efficient mid-grade device. Built on the imageRUNNER ADVANCE platform, this model delivers consistent ease-of-use with Canon devices, and outstanding performance inside and out. High-performing imaging technologies and toner allow for consistently striking images using Canon's V2 color profile, and the printer can produce output at up to 36 pages per minute in black-and-white and color. The imageRUNNER ADVANCE C355iF multifunction printer comes standard with a single-pass duplex scanner for scanning speeds up to 100ipm (300dpi) and features a large and intuitive user interface with flick and pinch technology for smartphone-like usability on many screens — the same display used on the other third generation imageRUNNER ADVANCE models. The imageRUNNER ADVANCE C355iF model gives workplace environments a reliable and easy-to-maintain solution delivering quality output and several impressive features, whether used as a stand-alone printer or as part of an entire fleet of devices. اطلاعات این محصول توسط نمایندگی کانن گردآوری شده است. در حال حاضر تنها تعمیرات دستگاه فتوکپی کانن در این مرکز انجام می شود و به زودی فروش دستگاه های کپی هم به خدمات نمایندگی افزوده خواهد شد. برای ثبت سفارش خرابی دستگاه خود فرم زیر را تکمیل نمایید تا در اولین فرصت پس از بررسی مشخصات فرم پرشده، همکار مربوطه با شما تماس گیرد.